For Friday night's game in Seattle, coach Mike Zimmer said he’s thought about forgoing a prescribed snap count to instead wait for a successful drive to pull his first unit. Redskins linebacker Trent Murphy. Redskins safety Su’a Cravens. Lions defensive end Kerry Hyder. Chargers linebacker Denzel Perryman. Packers cornerback Damarious Randall. Dolphins linebacker Raekwon McMillan. Those are just six of the significant players injured during the first week of the NFL preseason. 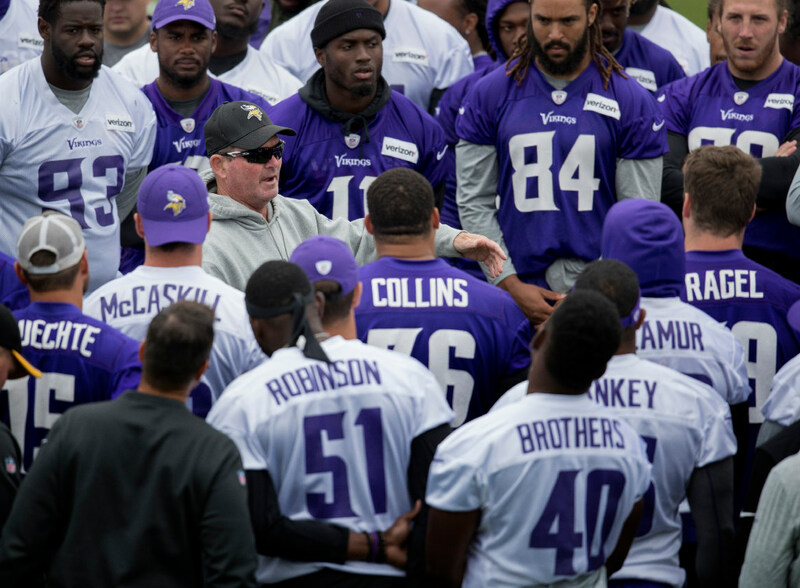 That’s on the mind of Vikings head coach Mike Zimmer, who is still deciding how much his starters will play in the next two exhibitions before shutting most down for the preseason finale. Is he going to stick with the traditional first half for starters during the third game on Aug. 27? The Vikings didn’t make it out of Buffalo unscathed during the preseason opener last week, losing running back Bishop Sankey to a torn ACL. Starting cornerback Trae Waynes also exited after two snaps due to what Zimmer called a “sore shoulder.” Waynes has not yet fully returned to practice as of Tuesday morning. Preseason reps for the starting offense is likely more of a conundrum for Zimmer after an underwhelming showing in Buffalo. Quarterback Sam Bradford and the starters picked up just one first down on three series against the Bills. “I’d like to see them play better,” he said. The Vikings had a set number of plays for the starting offense in Buffalo. On Friday night in Seattle, Zimmer said he’s thought about forgoing a prescribed snap count to instead wait for a successful drive. Twitter mailbag: Does Bower have a chance to make Vikings?